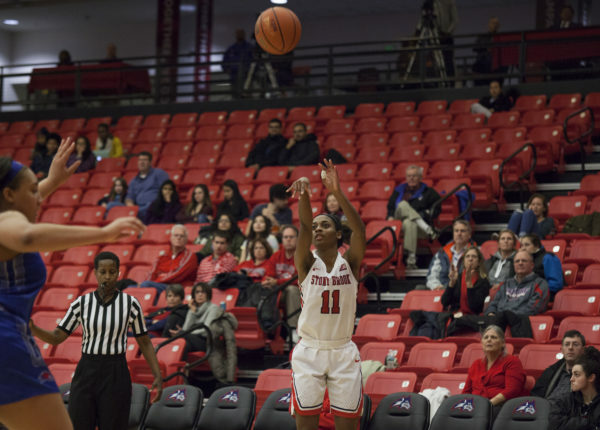 Stony Brook Women’s Basketball continued right where it left off against UMBC, picking up its second consecutive conference victory at Hartford 66-58 on Saturday, Feb. 3. Head coach Caroline McCombs was satisfied with her team’s ability to capitalize on numerous plays throughout the matchup. The Seawolves shot 44 percent from the field, the highest shooting percentage the team has posed in the past four games, in which they have gone 3-1. Junior guard Jerell Matthews continued her streak of finishing with double digits in points for the eighth time in nine games by leading all scorers with 24 points, also adding four rebounds and two assists. Heading into the fourth quarter, Stony Brook was holding on to a 43-42 lead after finishing the third quarter with a 10-5 run. The Seawolves resumed the offensive onslaught, going on a 7-2 run in the first three minutes of the fourth to extend their lead to six points. The team closed out the matchup on a strong offensive run, scoring a total of 23 points in the fourth quarter. That point total ties the most the Seawolves have scored in the fourth quarter all season, the last time coming against Albany on Jan. 27. The Seawolves, despite shooting 50 percent from the free-throw line, struggled from the charity stripe throughout the match. In the first half, the team nailed only three of its seven opportunities, accounting for 43 percent. The team’s free-throw shooting improved in the second half, finishing with a 57 percent shooting average. In the beginning of the game, Stony Brook struggled to find a rhythm, finishing the first quarter down six points. Hartford rallied in the quarter, going on a 14-4 run beginning at the 6:36 mark. The Seawolves outscored Hartford 17-13 in the second quarter, which allowed the team to bring the deficit within two. Stony Brook’s frontcourt dominated the paint, producing 24 points, including scoring one-third of the points in the fourth quarter. Freshman forward India Pagan and junior forward Cheyenne Clark accounted for six points each. Pagan finished the matchup with seven rebounds while Clark finished with six. Freshman forward McKenzie Bushee finished the game with 10 points — her second-highest scoring performance this season — eight rebounds and one block. Her ability to rebound the ball was crucial, as she accounted for five of the team’s 15 offensive rebounds, thus creating many second-chance opportunities for the team. Stony Brook finished the matchup with nine second-chance points and out-rebounded Hartford 45-34. Stony Brook now improves its record to 13-10 with the victory, including a 5-5 record in America East play. This is the first time that the Seawolves pose a .500 record in interconference play this season. The team returns home for its next game against conference foe Binghamton on Monday, Feb. 5 at 7 p.m.